It’s been a fast turn around for this edition of 5 Things I LOVED in Kpop This Week as we move to a new day. Every Monday, I’ll be sharing with you the 5 events in K-pop from the past week that I thought was just a bit more special than the rest. Last week, the Wonder Girls teased us in more ways than one, Jaejoong showed us his home, BEAST and the K-pop Roadshow hit Spain, INFINITE‘s Woo-hyun made his last appearance on Immortal Song 2, the men of Infinite Challenge got taken down in a game of knowledge by a little girl, and after the 2011 MTV EMAs yesterday… there was a paradigm shift in the Kpopiverse. In a photo shoot for Maison Korea, JYJ‘s Jaejoong shared with fans some intimate scenes from the interior of his home. He had a hand in designing his new luxury penthouse digs in which different areas had different decorating themes to fit their function for Jaejoong like the room he composes music in, his fashionable yet comfy living room, and his stylish and functional kitchen (he did show some cooking skills in Protect the Boss). The home is a solace for the busy and hard working hallyu star. The photo spread revealing Jaejoong’s home will be available in the November issue of Maison Korea. Loving this doesn’t make me a long distance stalker does it? Actors and former Family Outing members Kim Su-ro and Park Ye-jin were guests on the last episode of Running Man. In their first mission, the guests had to find the cast members via GPS and then pick and choose who they wanted to be on their team. Of course Ye-jin will always be the ‘sweet and savage lady’ and gave Yoo Jae-suk a hard time when she found him first. And what does Yoo Jae-suk do to win her favor? Just a little bump and grind, how could you not love Yoo Jae-suk? ZE:A‘s maknae Kim Dong-jun got the honor of being the youngest person to appear on the cover of Men’s Health Korea and I can see why. Keeping fit has been something Dong-jun has been doing for a while as he actively participated in sports and competed in gymnastics and soccer in high school. He has kept fit after his debut with the group’s practice regimen, working out with weights, and CrossFit training. Need I really say why I loved this? The boy is a lean, mean, K-pop idol machine. It’s M’m! M’m! Good! So, it’s been a little while since I’ve watched a K-drama because nothing really piqued my interest again until now. 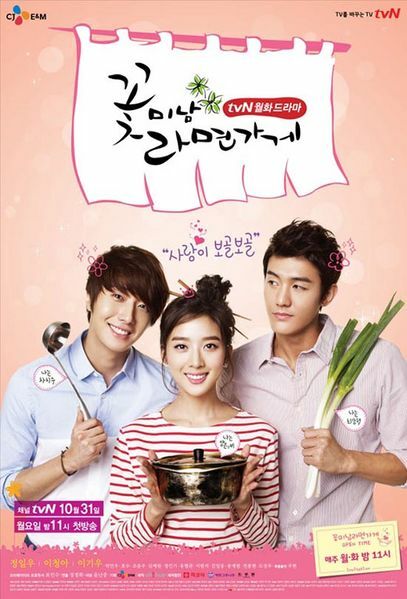 Jung Il-woo is the lead character, a spoiled young chaebol returning from the states named Cha Chi-soo. He is both mature from living abroad and childishly spoiled by his father, sophisticated yet rude, knowledgeable about how to woo a woman yet ignorant of how to satisfy one, and all around cheeky. Jung Il-woo plays him delightfully and if lead actress Lee Chung-ah hopes to keep up as the bumbling Yang Eun-bi, she’ll have to step up her game. To be fair, the story is just unraveling and by the end of episode two we find that Eun-bi is more than she seemed at first. It will be interesting to see how the story unfolds with its concept of ‘cool dating’ versus old school romance and… how 25 year old Eun-bi will stay out of jail if her leading man is a 19 year old high school student. Flower Boy Ramyun Shop is a Monday/Tuesday drama on tvN. And if you didn’t see this one coming it must be the first time you’ve read 5 Things. 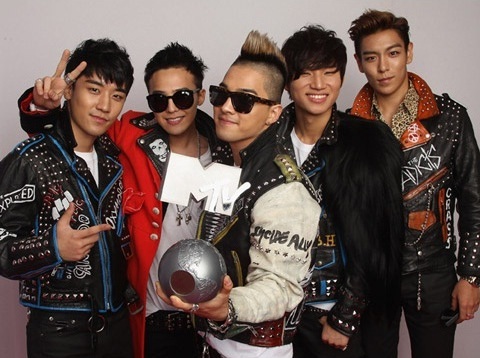 Big Bang won the inaugural MTV EMA award for Worldwide Act yesterday in Belfast, Ireland. It was a much needed positive boost for the group who is still recovering from the after affects of scandal. VIPs showed up in force to vote and individuals from other fandoms joined the effort because they recognized that the win wouldn’t only be beneficial to Big Bang, it would be beneficial to all of K-pop because of the Worldwide exposure it brought. Their combined efforts literally rocked the vote and took the EMAs by storm with a K-pop win over Britney Spears, which those who don’t know K-pop could never have imagined. There were tears, there was united K-pop pride, but in the end to fans of the group all that mattered were the five young men united again on stage… smiling. Those were the top 5 Things I LOVED in K-pop last week, were they yours? And I’d just like to say that I really enjoy watching the K-pop Roadshow Dance Cover Festival shows–it’s great seeing fans from all over the world sharing their love of K-pop. Even though I really like the shows, I’m not always able to fit them in 5 Things which is why I’ve started adding links to some of the Things that didn’t quite make it, but I think you should definitely still check out if you haven’t already. The previews of next week’s show with 2PM looks phenomenal.